Design your website with the top web professionals in India !! SEE OUR WORKS BEFORE YOU DECIDE. Our websites are Economic, Search Optimized, Unique and Productive. 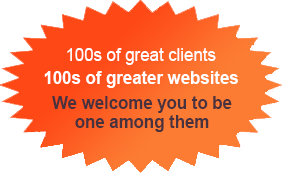 We have 100s of satisfied clients around the globe. We welcome you to be one among them. Identify your requirement in terms of Static pages?, Semi dynamic pages? and Dynamic pages? Pay only 10% total project cost, securely through 2CO. Send the materials (texts and images in any format) for the website to our email. With this payment we will create the home page of your website. Once you are happy with our work, pay 50% of the total project cost and we will complete the whole project. WE SEND YOU THE WHOLE WEBSITE ZIPPED AND HANDOVER ANY USER IDS AND PASSWORDS ASSOCIATED WITH YOUR WEBSITE. This is just to address your concerns. We are always there to assist you on your website related issues.